This bitter Beltway divide over tax policy driving the coverage—which intensified with President Obama’s latest proposals for reducing the deficit—made the U.S. economy the top story on last week’s news agenda. From September 19-25, the economy accounted for 23% of the newshole, up modestly from 20% the previous week, according to the Pew Research Center’s Project for Excellence in Journalism. And half of that economic coverage focused on the jobs and taxes debate set in motion by Obama’s September 8 speech introducing a $447 billion dollar job-creation package. A related budget story, and one characterized in the press as another example of Washington’s political dysfunction, was the No. 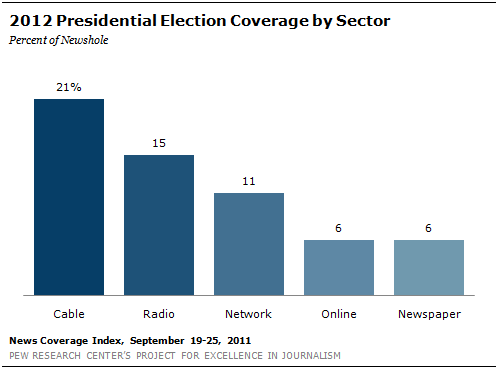 5 subject, at 4% of the newshole. That is the threat of a looming government shutdown, largely because of a dispute over how to fund the Federal Emergency Management Agency (FEMA). The No. 2 story last week was the presidential campaign (11%). There was a significant change in the GOP storyline. After weeks of basking in his lofty poll numbers, Texas Governor Rick Perry found himself on the receiving end of coverage questioning his political viability in the wake of a widely panned performance at the September 22 Republican debate. The third-biggest story, at 10%, was the Israeli-Palestinian situation which was highlighted by the Palestinian bid for statehood at the United Nations. Much of the coverage was gloomy — noting that the veto of the statehood application promised by the Obama administration put the U.S. in a difficult diplomatic situation with little prospect of any near-term progress in resolving the Israeli-Palestinian dispute. The No. 4 story (4%) was the September 21 execution of Troy Davis, the man convicted of the 1989 murder of a Georgia police officer. The case was controversial, with some witnesses recanting parts of their earlier testimony while Davis and his supporters maintained his innocence. In the media, the case also reopened a debate over the death penalty. The U.S. economy was the top story in all five media sectors last week, generating the most attention (28% of the newshole) on newspaper front pages. And it was a week defined by Obama’s deficit reduction plan, which was interpreted by some as signaling a new political strategy by the president. What followed for most of the week in the media narrative was partisan wrangling, perhaps foreshadowing a debate about taxing the wealthy that will become a defining issue in the 2012 presidential campaign. And on the airways, the pundits picked sides. That same night on the Fox News Channel, conservative host Bill O’Reilly countered that, “I’m not going to endorse a huge tax increase on anybody until the spending madness stops. Until the feds and the states demand efficiency and cut the crap, I will oppose targeted tax increases." 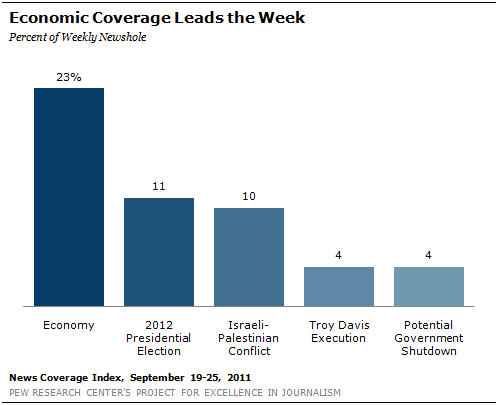 Co verage of the presidential campaign filled 11% of the newshole last week, down slightly from the week before (12%). And on the ideologically oriented cable and radio talk shows, the topic accounted for more than one-third (35%) of the airtime studied. As he has in every week since his mid-August entry into the race, Texas Governor Rick Perry registered as the top newsmaker among the Republican hopefuls last week. But this time his debate performance, which included a few notable stumbles, triggered a burst of negative commentary. By week’s end some pundits were questioning whether Perry, who had quickly zoomed to the top of the GOP presidential polls, would lose his frontrunner status. The drama at the United Nations, with the Palestinians seeking membership status, drove coverage of their dispute with Israeli to 10% of the newshole last week. For much of the week, the U.S. tried to convince the Palestinians to drop their bid, but when that failed, some of the coverage focused on the prospect for reduced U.S. influence in the region. The situation “at the United Nations underscored a stark new reality: the United States is facing the prospect of having to share, or even cede, its decades-long role as the architect of Middle East peacemaking,” stated a September 22 New York Times story. The controversy over the Troy Davis execution was the fourth biggest story in the news last week (4%), with Rhonda Cook of the Atlanta Journal-Constitution — who has been a media witness at 13 executions — setting the scene. 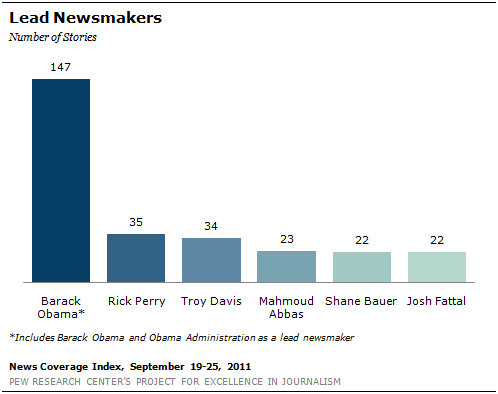 A s the central figure in last week’s fight over taxes, President Obama was a prominent newsmaker in 16% of the overall stories examined by PEJ — up from 12% the previous week. The man who hopes to face him in the general election, Rick Perry, was next, a prominent newsmaker in 4% of the stories — although some of that coverage was not flattering. Troy Davis, the convict put to death in Georgia last week, was close behind at No. 3, also at 4%. Palestinian President Mahmoud Abbas, who took his case to the UN last week, was the fourth leading newsmaker, at 3%. And the two Americans freed from an Iranian prison—Shane Bauer and Josh Fattal—were next, tied as lead newsmakers in 2% of the week’s stories.